1) Getting ready: I don’t have many “smart” clothes (especially since I’ve lost a lot of weight) but I still manage to look “dressed up” (for me) on most Sundays. I used to go to Church in jeans and a T-shirt but now I quite like making an effort to look nice – I even iron my blouse! 2) Walking to Church: I really like walking to Church, because everywhere is quite and peaceful. I often see other dressed up people, and I know they are going to their Churches (or mine) too. That makes me smile. I don’t know whether to thank God or pollution, but I’ve been very lucky with the weather, on Church mornings. 3) Holy Water: The whole idea of Holy Water really appeals to me and the Anglican Church are right up there with the Catholics, when it comes to using it. It is awesome – it kills vampires, it frightens off demons and it purifies us, or something. I love the little stoup of water that we cross ourselves with, before entering the Church. Sometimes the Priest flicks Holy Water over us during the service and I struggle to decide how long it is polite to wait, before cleaning it off the lenses of my glasses. 4) Crossing myself: I like doing this but I had to learn how. I’m left-handed and I’m suspicious that the first few times I did it I was summoning the Devil by mistake. Not only does crossing myself make me feel Holy, it also makes me feel like I’m in a film, or I’m a Nun, or I’m a competitive sports legend. 5) The Church interior and stained-glass windows: Our Church is really old and traditional and beautiful. I love that. 6) The service: The Anglican Church put on a really good service. Loads of ornate things to say and reply, lots of standing up and down – and more songs than the Eurovision Song Contest. Brilliant. And I like the whole “Peace be with you” bit, where we go around shaking hands with everyone – I deliberately choose grumpy old people, and disruptive little kids. 7) The sermon: I have, so far, never been bored by a sermon. What more can I say? I love it when the Priest (or whoever) goes, “Yesterday I was mowing my lawn and it suddenly struck me that a lawn mower is very much like Jesus…”. Hilarious. Every sermon I’ve heard has been thought-provoking and intelligent though. 8) Holy Communion: I’m still not Confirmed but I like going up for a Blessing. 9) The wine/tea/cakes: Staying after Church, sharing refreshments and chatting, is great fun. We have had a celebration of some kind almost every week though and that means glasses of wine BEFORE lunch. I must say, the only times I have been tipsy, since Christmas, can all be blamed on drinking after Church, in the Church building. Scandalous. 10) The walk home: I like walking home from Church, looking fine, full of the Holy Spirit and possibly with a nice little boozy buzz on. I like seeing how the streets have got busy and I stop off at the Asda to buy milk and cat food. Going to Church is well worth the effort. 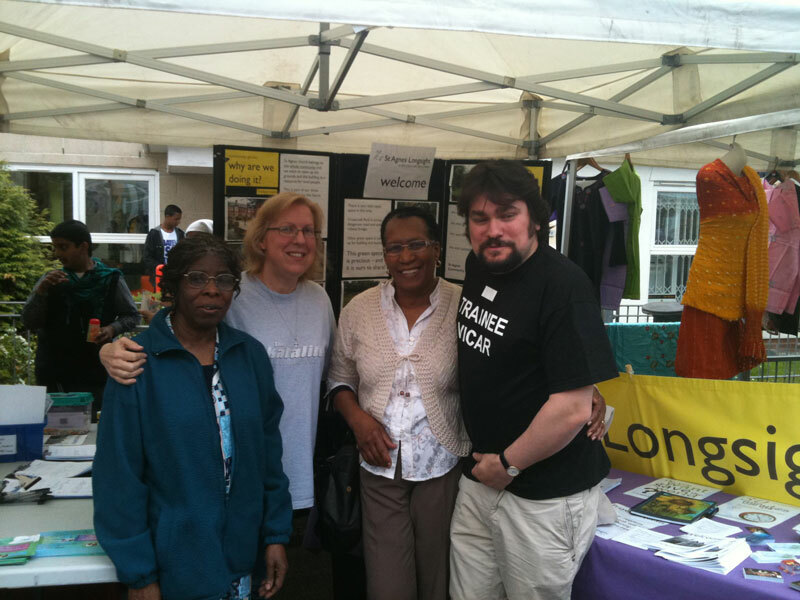 I spent my Bank Holiday Monday afternoon at Longsight Neighbourhood Festival, helping to run a stall. We were inviting people to attend our Church and highlighting the new gardens that the Church want to build (and open for the wider community to use). Work should be starting soon. I found it a little daunting to hand out Christian literature, in an area that is 70% Muslim and where quite a few women even go so far as to wear the full veil. I didn’t want to upset or offend anybody. I need not have worried, as everyone was very open to our efforts and most tolerant and polite. Many Muslims came and looked at, or picked up, our flyers. In fact, most very religious Muslims embrace the opportunity to study other religions. I think if we had been doing the same thing in an area of similar economic deprivation but where people were of no religious inclination at all, we would have faired worse and possibly had a strong negative response to our presence. Of course, most people in Longsight do not wear the full veil ( and I presume even those that do don’t wear it at home), so many of the stalls were selling absolutely beautiful dresses and scarves. There was a stilt-walker, the Mayor came to visit (with his wife) and our local MP, Gerald Kaufman, showed up. Kids were running around everywhere with goldfishes in plastic bags, which was a bit sad but they were thrilled to have won something so precious! I don’t know what they had to do to win them but it must have been quite easy. Tiny fish-tanks were on sale at the same stall for £4 each… I think I can see where the profit on letting kids win came in – many begged £4 from their parents as the bags got annoying to care for. There was live music (of variable quality) and the queue for Face Painting grew so long that the man doing it seemingly fled – leaving a miffed crowd of parents and children. The kids that were painted looked amazing though and kept coming over to say “hello Sir!” to Father Stephen, as he preaches at the school. I’d have liked a CHAIR but other than that, it was great fun. What?! I’m OLD.